How would you like to cook the food, set the table and make sure everyone eats. Then at the end of the night nobody says thank you or job well done? How would you feel if you were rarely acknowledged for doing your part in making the evening a sucess for everyone? 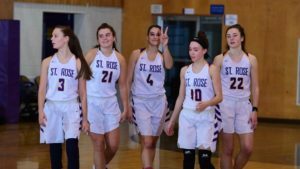 Well for 4 years Maggie Stapleton and Sam Mikos have been setting the table at St. Rose. They have been mainstays. They have been winners, no two players have given more of themselves and have gotten so little in return. Sam Mikos and Maggie Stapleton are stars too…it’s just nobody wants to admit it. Each night, St. Rose walks on the floor to start a game. Sam Mikos and Maggie Stapleton know they will be doing the dirty work that doesn’t always show up n the box score. Sam Mikos knows it will be her job to turn the lights out on the other teams best offenseive player, regardless of there position or status. It could be a super baby like JUSTINE PISSOTT of RBC or a mega star like FAITH MASONIOUS of MANASQUAN. It doesn’t matter and after the game she knows, she will be given little credit if any or worse hear excuses given to those she puts in handcuffs. It’s funny how so many great players just have a “off night” against Mikos. Her senior running mate Maggie Stapleton knows that she is a deadly shooter and scorer. But she knows she’s the team’s smartest and best passer too. So it’s up to her to willingly make the sacrifice on offense for her teammates. It’s she that makes teammates look good with her passing and screening. It’s she that passes up shots and ALWAYS make the extra pass. She does all these things knowing it will not show up in the paper. Both also know without them St. Rose is an ordinary team at best. They know they could put up points and stats. Yet they have decided somebody on the team has to make the sacrifice and it’s them. Leadership matters just ask any coach without it. 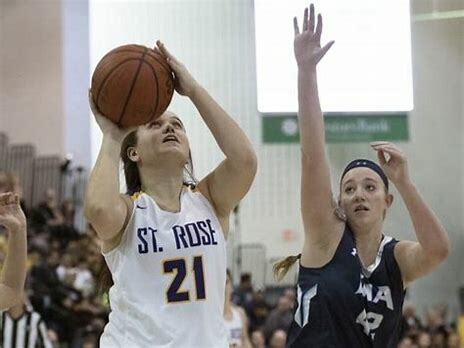 Sam Mikos and Maggie Stapleton are dripping with leadership everyday for St. Rose. They both GET IT. Both have every right to want the spotlight after 3 years of doing everything for everyone else. Sam Mikos has been a starter for 2 years on one of the best teams in the country. Yet you’d never know it, she has made big plays and big shots along the way, yet few know this. She would have every right to be a little selfish as a senior this year. Get some stat padding minutes, a little Spotlight time. But she understands this team doesn’t need that. But if called upon as she did against Manasquan early, she will go get a big bucket. She could fuss and complain that nobody runs a play for her or appreciates what she does. But she has chosen to win and once again has allowed her teammates to have the spotlight. Her value is just as important and maybe more. She is having a monster season but if you read the papers …you would never know. She is a rebounding machine and a COMPLETE PLAYER. But Sam Mikos is ok with all this…she sees the bigger picture. It’s why you will notice when St. Rose gets out of control or lose their composure. Notice who has the ball in there hands. Notice who provides that calming affect….SAM MIKOS thats who!! It’s her leadership that you can’t read in a box score. Maikos is a player the coaches and players can lean on…do you know why? Because she can take the heat and not afraid to get into the fire. Maggie Stapleton has heard it over the years. She knows that for 3 years she has been doubted. St. Rose has had great talent over the years. But she must be wondering why it has taken this long for her to shine. She has worked on her game every year and been a good soldier. When given the chance she has always delivered for St. Rose. It’s seems she has never been able to do enough for people. This year once again people don’t realize her impact. She has not been given a red carpet at any point in her career. 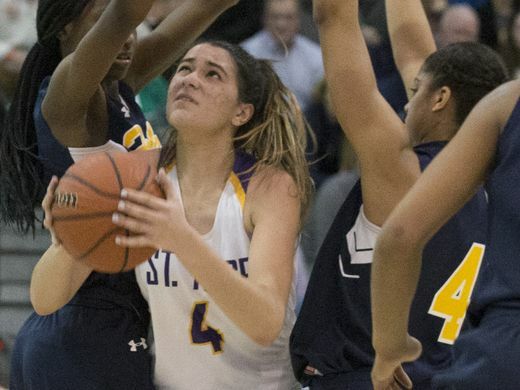 Everyone knows of her shooting talents and passing skills, if they’ve been to a St. Rose game. Yet you never hear how she is forced to play out of position just about every night. She is asked, just about every game to defend a post player, bigger and stronger than her. Maggie Stapleton does all the dirty work without the accolades. They don’t put deflections, hustle and loose balls in box scores. Throughout her career MAGGIE has always stepped up in big games. This year she is just doing it more often with a bigger role as a captain and team leader. It could be with a sweet drop pass or a big three to put a top team like Manasquan or RBC on there heels. 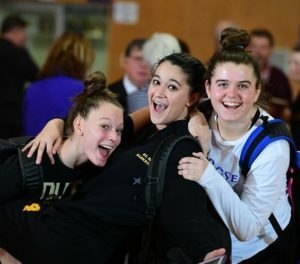 It could be killing Nationally ranked Christian Academy with her insane passing, rebounding and help defense. Maggie Stapleton’s impact on games cannot be measured by numbers. She has long accepted others will get the hype. But she knows what matters most when it comes to winning. She is being a senior and not worrying about the spotlight. She is worried about rings. Her IQ makes the entire St. Rose roster smarter and better. It doesn’t make sense, but for some reason Maggie is willing to do anything that has been asked of her on any night. When asked to score, she has done that. When asked to defend she has done that. She has been the ULITIMATE TEAMMATE and it’s okay with her… if she doesn’t get her due. Sam Mikos will be attending Kutztown University on a scholarship and Maggie Stapleton will attend Gettysburg University. Both committed months ago, there was no big fanfare. They was nothing in the papers. There was no big announcement, blog or acknowledgement like other players get. It’s just way it’s been for these two stars. I call them stars because that’s exactly what they are. These two could be going for personal achievements like so many other kids do. Trust me, both could be putting up more points and taking more shots. They chose not to do this, they know there are things there teammates don’t do as well. So they choose to do these things FOR THEM, it leads to winning not necessarily headlines or the spotlight. They call others stars but not them, it’s silly but it’s the way it is these days. Without Mikos and Stapleton there would be no so called stars and certainly no headline victories.. The M&M sisters is what I am going to call them..because the truth is they have been together so long and making sacrifices for so long….WHY CHANGE NOW! They’ll just keep being Stars in their own very special way.